NOTE: Date must be in the form YYYY-MM-DD, like 2018-12-06. The Lindsey Wilson (4-2) wrestling team defeated NCAA Division II member Bellarmine (Ky.) 27-12 on Thursday night in what is their first of three straight dual meets. On the night the Blue Raiders would record two pins, one technical fall, one major decision and two decision victories as they were able to win six-of- nine matches for the dual. 2018-12-06 - Columbia, KY - Photo from Amanda Davis. 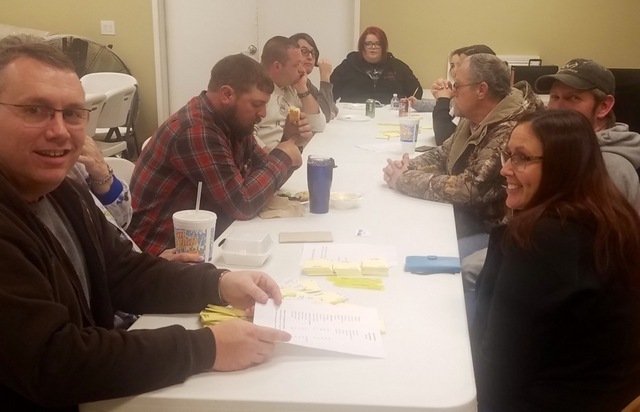 The annual Adair County Jaycees radio auction fundraiser is underway again tonight, December 6, 2018, from 6-9pmCT. Items that have been donated are being auctioned to the highest call-in bidders and proceeds will be used to help families at Christmas with food and toys. Some of those working last night at the start of the auction, answering phones and running bids to the ones on the radio and announcing were Jamie Hadley, Dan Held, Adam Roy, Cameron Cox, Sara Davis, Becky Brockman, Anthony Brockman, Marc Evans, Jason Stotts, Jennifer Carter and Marshall Judd. Frankfort, KY - Gov. Matt Bevin has directed that flags at all state office buildings be lowered to half-staff on Friday, Dec. 7, 2018, in observance of National Pearl Harbor Remembrance Day. This is in memory and honor of the more than 2,400 Americans who died in the surprise attack on the U.S. Fleet's Pearl Harbor base in the early morning hours of Dec. 7, 1941. President Franklin D. Roosevelt declared Dec. 7, 1941 "a date which will live in infamy" and signed the Declaration of War against Japan the following day, Dec. 8, 77 years ago. Although flags statewide are presently at half-staff in honor of former President George H.W. Bush, Friday's flag lowering will also serve to honor those lost in the attack on Pearl Harbor. The annual Adair County Jaycees radio auction fundraiser is underway again tonight, December 6, 2018, from 6-9pmCT. Items that have been donated are being auctioned to the highest call-in bidders and proceeds will be used to help families at Christmas with food and toys. Some of those working last night at the start of the auction, answering phones and running bids to the ones on the radio and announcing were Jamie Hadley, Dan Held, Adam Roy, Cameron Cox, Sara Davis, Becky Brockman, Anthony Brockman, Marc Evans, Jason Stotts, Jennifer Carter and Marshall Judd. Former President George H.W. Bush attended Derby, drove a tank, got a dog. Former President George H.W. Bush and his wife, Barbara, were no strangers to Kentucky, thanks to their nearly six-decade friendship with William Stamps Farish III and his wife, Sarah, of Versailles. Bush, whose funeral was Wednesday in Washington, visited Lane's End Farm in Woodford County many times. The Bushes attended several Kentucky Derbies and races at Keeneland with the Farishes. They dedicated three Lexington buildings and headlined several Republican fundraisers and rallies in the state. The Farishes gave the Bushes their famous White House dog, Millie, and their springer spaniel sired her litter of puppies. That was big news in what the former president would have called a "kinder and gentler" era of presidential politics. Read the full article at kentucky.com. The Russell County Hospital Relay for Life is hosting Breakfast with Santa on Saturday, December 08, 2018, from 7amCT until 10:30amCT at 3trees Church, 3515 KY-80, Russell Springs, KY.
New I-65 Interchange coming to Bullitt Co.
Frankfort, KY - Gov. Matt Bevin today joined Congressman Brett Guthrie, Kentucky Transportation Cabinet (KYTC) Secretary Greg Thomas, state legislators, local officials and leaders from the business community to kick off construction of a new interchange on Interstate 65 that will improve connectivity and support increased economic development in Bullitt County. Construction of the new interchange begins this week, and much of the initial work will involve cross-country excavation of approximately one million cubic yards of rock and soil for building the new connector road. Traffic impacts during the first phase will be minimal and limited to equipment accessing the project area from KY 61. County Attorneys Jennifer Hutchison-Corbin, Russ Goff, Kevin Shearer and John D. Bertram were all praised at recent Frankfort awards ceremony for their work to benefit Kentucky children. Frankfort, KY - The Kentucky Cabinet for Health and Family Services (CHFS) has announced the state's 20 top-performing child support collection partners from the past year, and has recognized other staff who have increased payments for children served by the child support program. Frankfort, KY - The Kentucky Transportation Cabinet has announced all personalized license plates will transition to a birth month expiration beginning January 2, 2019 to comply with House Bill 530. This legislative change brings personalized license plates in line with standard issue plates that expire on the last day of the vehicle owner's birth month. Currently, personalized license plates expire annually on December 31 and all applicants must renew their registration in-person at their local County Clerk's office between November 15 and December 31. Beginning in January 2019, individuals with January, February or March birth months will renew their personalized plates in person or online anytime between their birth month and April 30, 2019. All other birth months will renew by the last day of their birth month. In 2020, all applicants will renew by the last day of their birth month. Years ago, when we purchased a brand new Ford Ranger, several people asked me if I worried about someone damaging it with their vehicle. My answer: I drive as if a bomb might drop in front of me any second. I still follow the "bomb might drop" philosophy of driving and it has helped me avoid accidents several times. Elzie LeRon "Ron" Harper, age 45, of Edmonton departed this life on Monday December 3, 2018 at the Kindred Rehab Center in Louisville. Funeral services will be held 1pmCT Thursday, December 6, 2018 at the Butler Funeral Home in Edmonton with burial in the Pleasant Hill Cemetery. Visitation is after 9amCT at the funeral home. The Lindsey Wilson College Choir and Singers will be at Russell Springs United Methodist Church, 206 Jamestown Street, Russell Springs, KY for a Christmas Concert on Sunday, December 9, 2018 at 6pmCT. Everyone is invited to come and share in this beautiful time of worship through song as we look forward to celebrating the birth of the Savior of the world. CAMPBELLSVILLE, Ky. - As the year comes to a close, Campbellsville University is reflecting on the honor it received this fall from The Kentucky State Nature Preserve Commission. It gave the Kentucky Heritage Land Conservation Fund Stewardship Award to Campbellsville University for its supervision of Clay Hill Memorial Forest. Paula Garrison, Coordinator of ACPC Family Resource Center, reminds everyone that it's time to register for Grandparents "ROCK", (Raising Our Children's Kids), a Free event. This is for Grandparents, plus those raising other people's children, December 13, 2018 from 8:30amCT until 1pmCT at the Adair County Extension Office, 409 Fairground Street, Columbia, KY. Bowling Green, KY - Western Kentucky University's five academic colleges will recognize more than 1,400 fall graduates in ceremonies on Saturday, December 15, 2018. During the daylong special recognition ceremonies at Diddle Arena, WKU will confer degrees to 1,418 graduates - 11 doctoral, 255 master's, 967 bachelor's and 67 associate degrees and 79 undergraduate and 39 graduate certificates. It's currently 24F at the Adair County Mesonet station. It should be mostly sunny today, with a high near 44F. Southwest wind 5 to 9 mph. There is a slight chance of snow before midnight tonight, then a slight chance of drizzle between midnight and 3amCT overnight. Cloudy, with an overnight low around 29F. Southwest wind around 6 mph becoming north after midnight. Chance of precipitation is 20%. On Friday, expect mostly cloudy skies, with a high near 38F. North wind 3 to 5 mph. Casey County: No events Circuit Court. 20 events District Court. Cumberland County: No events Circuit Court. 3 events District Court. Metcalfe County: 3 events Circuit Court. 1 event District Court. Taylor County: No events Circuit Court. No events District Court. --Robert Stone, Thursday, 6 December 2018.